Now I’m not a believer of Karma (in a nutshell – belief that what goes around comes around) but a few weeks ago I wrote a rant about people tagging all their friends in these collage pictures (Facebook: Stop Tagging These) like smiley faces, pinup girls, etc etc…and how stupid/annoying I thought it was. 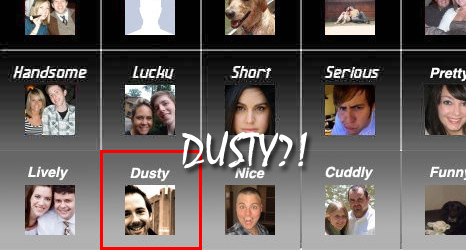 Well I was again tagged in one of these pictures the other day and I was tagged as “Dusty” in this one. WTF does that mean? I’m not physically dirty… I thought maybe that it’s because my picture was a black and white picture with some sepia tones – but then how are other people pictures Lucky or Cuddly or Nice? It’s hard to tell someone’s personality from a picture of them with a milk mustache. I asked the kind tagger what “dusty meant” and they said they weren’t sure but my picture looked dusty cause it was brown. Thanks. Thanks a lot. I’m officially this guy. It wasn’t the notification that alerted me to the fact that someone had tagged me in one of these collages – it was the fact that I had around 17 newsfeed items from my friends being tagged in the same picture. I know the argument is “QQ I can do what I want, it’s MY facebook!” but it’s really annoying and nobody really likes these things but you. One more time: QUIT TAGGING THESE!